Congratulations Boys Golf Ocean League Champs! Mira Costa's Boys Golf team wins the Ocean League title for 2019! Great job! Click for further details. 8th Annual MCHS Distinguished Alumni Hall of Fame - Now Accepting Nominations! Nominations are being accepted through May 10 for the 2019 class of Distinguished Alumni. Do you know a former Mustang who has used their education and experiences to excel in their chosen profession as well as make positive contributions to society? Click here for the nomination form. Congratulations to Vocal Ensemble for receiving a perfect score! Click to see details. Congratulations to Ms. Patty Perkinson in being named the Girls Soccer Coach of the Year! Click to see the article in the Daily Breeze. Congratulations Ms. Claypoole, Saint Mary's Teacher of Impact award winner! Ms. Claypoole has been selected for this wonderful honor. Please click for further information. Congratulations to Mr. Park and the Mira Costa Orchestras! All three ensembles earned a "Unanimous Superior" rating at the SCSBOA festival. Click for more details. Costa Drama/Tech Wins Multiple Awards At Fullerton Theatre Festival! Congratulations to Mira Costa Drama/Tech for taking home awards in several categories at the Fullerton College High School Theatre Festival. Click to view more details. 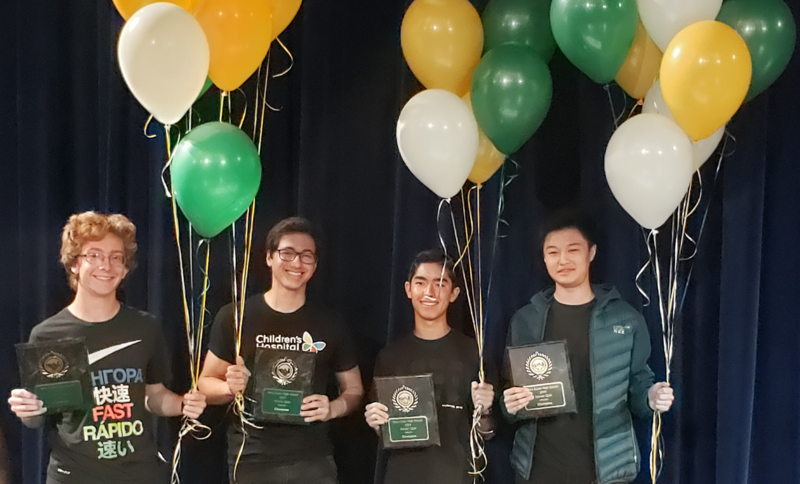 Congratulations to our Scholar Quiz winners Kevin Chen, Alex Fiorito, Russell Blakey, and Avery Haaz-Goldberg. Click here to see a winning photo! Click here to view a short video of one of Mira Costa's students, Parker Lynch, honored at the Manhattan Beach City Council on March 6, 2019. 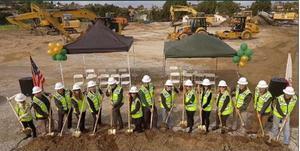 MCHS gym groundbreaking was held Friday, Feb. 15, 2019. 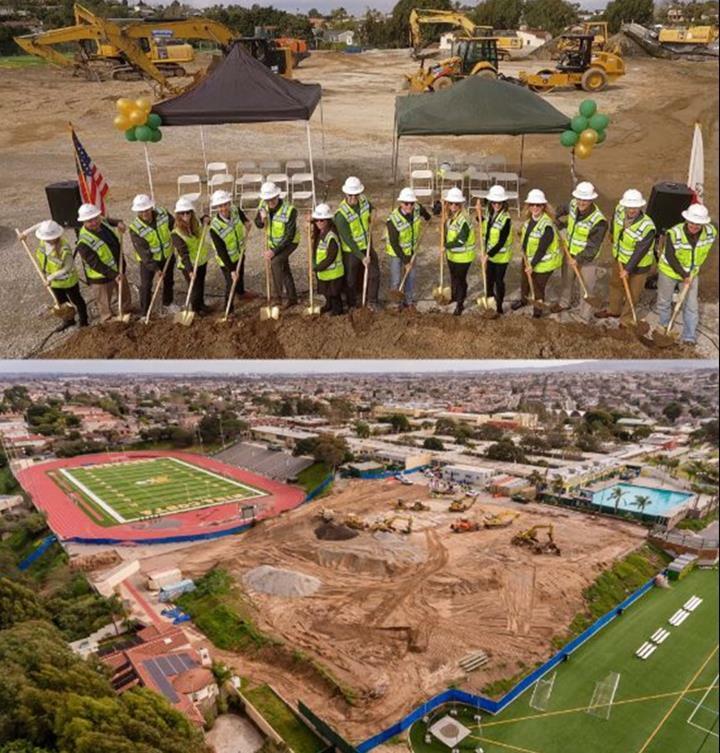 This is just the start in creating our wonderful new athletic complex at Mira Costa! Congratulations to our National Merit Finalists. Click here for detailed information. 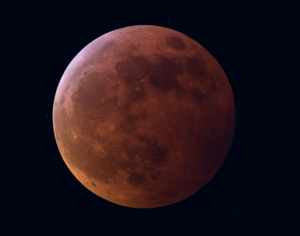 Astrophysics takes a fabulous photo of the Super Blood Wolf Moon Eclipse of 2019. Mira Costa Band goes to Orlando for 2018 All National Honor Ensembles. Click to view a short video. Congratulations Joseph Olivas in being chosen to represent Mira Costa in the 2018 All-National Honor Ensemble Concert Band. Click to see more. Congratulations Girls Cross Country for placing 3rd in Division 1 State tournament! Go Mustangs! Mira Costa lost our beloved trainer, colleague, and friend. Tim trained thousands of athletes over the course of his career. A scholarship will be set up in Tim's name. For information on how to donate, or to watch a beautiful video tribute click Tim's picture. Four outstanding Mira Costa graduates will be honored on Friday, September 21 for their positive contributions to society. Inductees will be featured at assemblies and feted at breakfast and lunch receptions before being celebrated at the football half-time show Friday evening. Click the shield to see their biographies. created by Richard Hessenius, Class of 1970. Mira Costa Drama/Tech’s upcoming production of The Laramie Project will be featured on Blog Talk Radio’s “The South Bay Show: Manhattan Beach Chamber 360º.” Click for further details. Congratulations to our scholarship winners. Click for details. MCHS is proud to announce Mr. Jonathan Westerberg as Teacher of the Year. Click here for more on Mr. Westerberg. 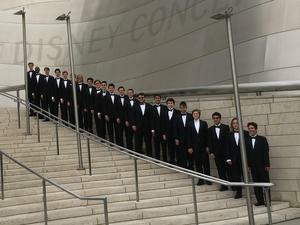 These past weeks, the Mira Costa Choirs have been very busy and extremely successful. Performance at St. Thomas the Apostle Hollywood. Clickhere for the entire story. Xavier raced to the top at 9:06.62 in the Boys 3200m! Click to watch the race. Congratulations to Mira Costa Drama/Tech for winning the Sweepstakes Award. Click to discover more. Congratulations to all student musicians in the Rotary Solo Music Competition. Click here for the story! Mira Costa students reignite love of music by teaching grade schoolers. Click here to view The Beach Reporter news article. 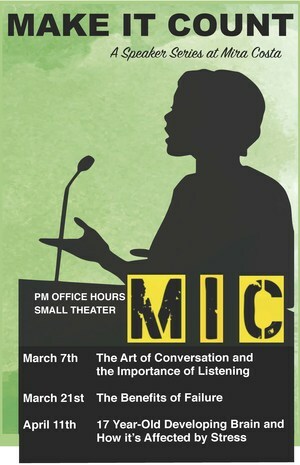 Make it Count - A speaker series at Mira Costa. Mira Costa's Drama/Tech Dept. 's annual AIDS Benefit show was a spectacular evening. Click here for more details. Spotlight is a scholarship and training program, which encourages personal and artistic growth, while exploring new possibilities in the arts! Click here to view the list of MCHS students who have been chosen. On Tuesday, Dec. 5th, Mira Costa’s Drama/Tech Dept. held its annual Holiday Benefit show. Click here to read about this event. Congratulations to Kira Levin as a Young Arts Finalist! Click for more details. MCHS receives 9 nominations! Click here for more details. Congratulations to our Mira Costa Mustang Ruggers! Click for more information. 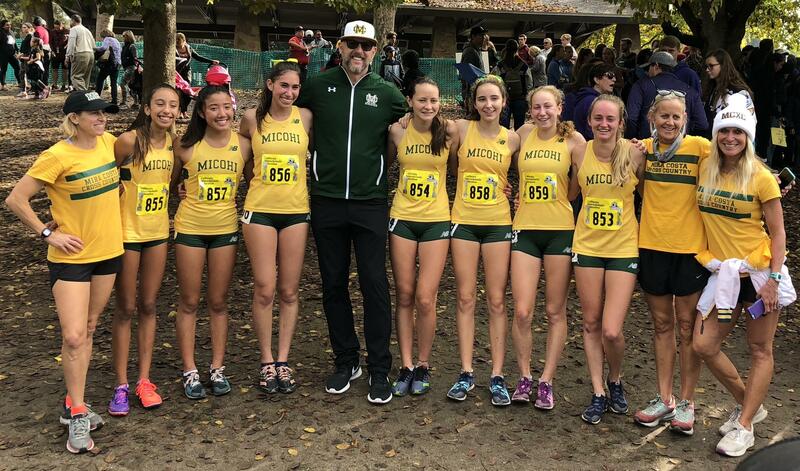 Mustangs dominate at CIF: sophmore Crisera takes gold! Congratulations Jack Major Boys Golf Ocean League Player of the Year! MCHS Boys Golf team are Ocean League Champions! MCHS Boys Tennis wins first round CIF playoffs! 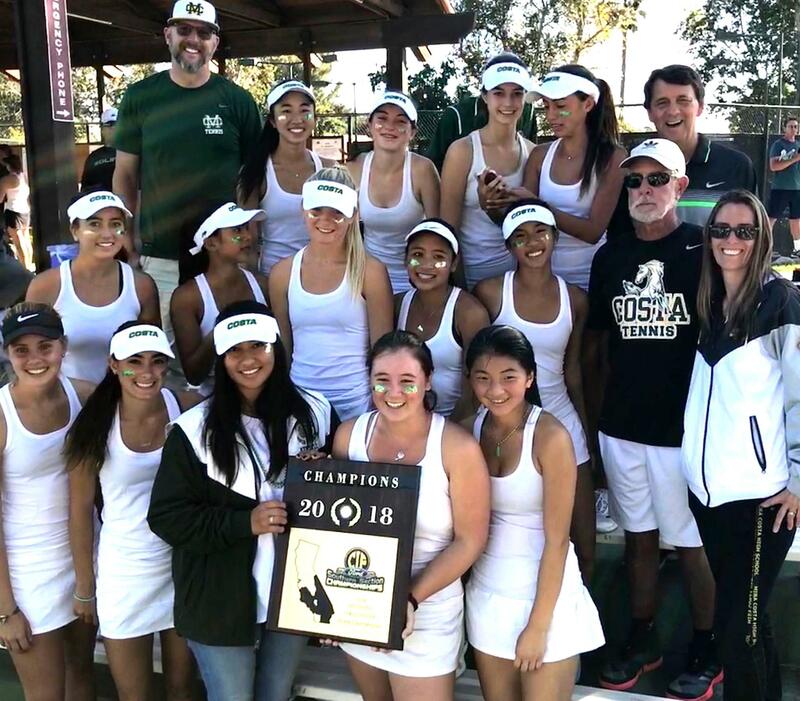 Well done Mira Costa Boys Tennis Team! Congratulations MCHS Boys Lacrosse Team! MCHS Boys Lacrosse Clinches Invitational Title! Tyler Heintz on the cover of LA Times! Tyler Heintz is on the cover of the LA Times California section! Click here to read more. MCHS is so proud! Click here for more information. Mira Costa Dance Team wins National Title! Congratulations to Peter Lu in winning the 2017 MHCS Scholar Quiz. Congratulations to the MCHS Colorguard! Congratulations to the MCHS Colorguard! They placed 1st in their division over the weekend at the Azusa Tournament. 17th MCHS All Media Art Show! A culminating event for the Mira Costa Art Department that features select work of students from the 9th through 12th grades. MCHS student musicians were honored recently by the Manhattan Beach Rotary Club. Click here for more information. MCHS featured on Blog Talk Radio’s “The South Bay Show: Manhattan Beach 360”! "The South Bay Show" featured a podcast interview with Michael Hayden, Director of Choirs, Mark McCormick, Pianist, and students Kayla Elson, Emily Chase, Isabel Gray, Azaan Esmail, and Kavita Sarathy from Mira Costa Choirs. Click the icon to listen. Mira Costa is proud to announce that three of our students were named 2017 National YoungArts Foundation Honorable Mention Winners. Members of the MCHS Marching Band and Colorguard performed at Disneyland on Feb. 25, 2017. Mira Costa High School returns to the Manhattan Beach Art Center for its 17th Annual All Media Art Show, a culminating event for the Mira Costa Art Department that features select work of students from the 9th through 12th grades, showcasing their experimentations and explorations in a variety of artistic media. MCHS Jazz Band Rocks in Boston! Congratulations to all Reflections Art Contest Winners! A big hand of applause for all Reflections Art Contest winners! Congratulations! Please click the picture to view all of Mira Costa's talented art winners. There are 10 students from MCHS who made the quarterfinal round of the Spotlight Awards. Spotlight is a nationally acclaimed scholarship and training program for high school students in Southern California. On Jan. 13th - 15th, Mira Costa's Drama/Tech students participated in the California Educational Theatre Association (CETA) Festival, where Costa won top honors in several categories for its production of Almost, Maine. Congratulations to Costa junior Philip Wah for being selected among an elite number of students across the country to participate in the Disney Dreamers Academy in March 2017. Intellectually curious, compassionate and courageous leaders are chosen each year for this honor. Congratulations, Philip! Cal-Hi #1 Sports School in the State! Congratulations to MCHS Athletic Teams for being named the Cal-Hi Sports State School of the Year for 2016! Go Team Costa! The Mira Costa Drama Department has been selected to perform their entire show of ALMOST, MAINE representing LA county at the CETA (California Educational Theatre Association) Festival in January.. Thanks to the Mira Costa Dance Team for participating in the Santa Parade! La Vista Crown Award 2016! MCHS La Vista selected as prestigious Crown Award Finalist by the Columbia Scholastic Press Association. MCHS Marching Band & Colorguard 1st Place! Congratulations to the MCHS Marching Band and Colorguard on another fantastic showing at the Golden State Tournament this weekend. Mira Costa MUN Charges Through Edison! MCHS MUN's victory proved to be one of the largest in the last three years of MUN at Edison and it bodes well for the rest of the MUN season. Click for more information. A huge congratulation goes out to senior, CHLOE TOWNS for winning her 2nd consecutive National Championship in her weight class in Tai Kwon Do. In November, Chloe will be representing the United States in the Junior World Championships in Burnaby, Canada. We are very proud of your outstanding accomplishments you have made in your sport! We all wish you the very best in the world championships. ... so little space! Please click 'Show All' at the bottom of this column to see them all. MCHS Named Cal-Hi Sports State School of the Year! Mustangs' strength across the board helped earn this first-time statewide honor. Click here for the full article. Congratulations to freshman violinist Kevin Chen who was featured as a soloist with the Beach Cities Symphony in late May as one of four winners of the MTAC “Artist of the Future” Competition. As observed by Mira Costa orchestra director Mr. Park, “Kevin’s performance was outstanding. His exceptional skills and artistry on stage exemplified a level of maturity and energy that left the audience sitting on the edge of their seats!” Click photo for more. Congratulations to Broadcast Journalism student Miriam Sachs who was named MCHS Student of the Year. Miriam has been in Cinematic Arts and Broadcast Journalism classes since her freshman year and has created award-winning projects that have screened at festivals around the country. Click graphic for more and to see her video! Congratulations to the Mira Costa Bands and Orchestras on their stellar performance at Carnegie Hall in New York City this Memorial Day weekend. Over 266 students made the trip to New York where they saw the sights, caught a Broadway show and then played to a large crowd on this fabled stage under the direction of Joel Carlson and Peter Park. Their hard work and talent showed the best of our Mira Costa spirit. Click logo for our complete list! Isabelle Connor just competed at the Olympic Training Center in Lake Placid, NY in USA Rhythmic Gymnastics National Qualifiers. Isabelle placed 1st in Hoop, 1st in Clubs, 2nd in Ball and 2nd All Around in the level 9 senior division. Better yet, Isabelle qualified for level 10, one of only 3 level 9 seniors nationally to be promoted. Isabelle is also Region 1 Champion Athlete of the Year for the second year in a row, and State Champion. MCHS orchestra director Mr. Peter Park has been invited by the IU Jacobs School of Music to conduct the 2016 Indiana University Summer Music Clinic Orchestra. Held in Bloomington, Indiana each June, the IUSMC attracts advanced high school musicians annually from over 40 states as well as from several countries in Asia and Europe. According to Mr. Park, past guest conductors have included nationally renowned music clinicians and college professors, so it was a personal honor for him to accept this invitation. Congratulations to Mira Costa's Jazz 1 and Jazz 2 Bands! The Jazz 2 Band took first place in their division at the RCC Jazz Festival in Riverside on May 13, while the Jazz 1 class Combos took 1st, 2nd and 3rd place in their division. BCR, comprised of students from Mira Costa and RUHS, took 3rd out of the 75 teams in their "Hopper" grouping (there were 600 total teams broken up in 8 groups). Despite a stellar performance, it was not enough to make the final (needed to be top team in the division). Click photo for details and a video of their robot in action! 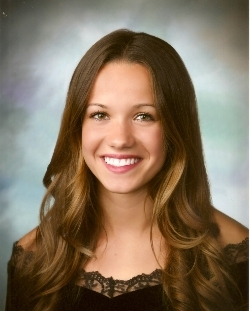 Costa senior Taya Stewart was awarded the prestigious Gates Millennium Scholarship. As a recipient of this award, she will receive a fully funded scholarship covering tuition, books, and room and board through a doctorate degree. This highly selective program receives thousands of applications each year, with only 1,000 students receiving the award, which is funded by a $1 billion grant from the Bill and Melinda Gates Foundation. Congratulations, Taya! MC Dance Team Sweeps at Sharp Nationals! After a year of hard work and dedication the team came up big winners! The team placed first in senior large jazz, senior large lyrical and senior large hip hop. The team won the Team Overall Highest Point Champions for the first time at Nationals and the big trophy!! Go Costa! 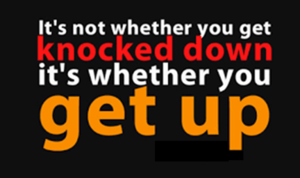 Click picture for more. The Mira Costa HS Orchestras performed at an SCSBOA sanctioned music festival on March 16th at Millikan HS in Long Beach. 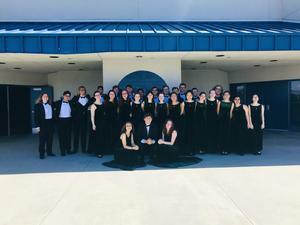 The Philharmonic, Symphony, and Chamber Orchestras all earned a unanimous superior rating from the festival adjudicators. This is the highest possible rating reserved for groups that achieve "the finest conceivable performance…worthy of the distinction of being recognized as among the very best.” Congratulations to all orchestra students for their dedicated work! Congratulations to the MCHS Winterguard who placed 2nd in their Division on March 12 at the Lynwood High School Competition. Their show "The Lost Boys" is based on the story of Peter Pan in Neverland. Members of the Winterguard team are: Kyra Solis, Macy Jaeger, Abby Coleman, Kier'a Richard, Porter Hines and Stephan Oliveria. For the fourth year in a row, Mira Costa High School’s Drama Department has won Best Musical Theater performance at the Fullerton College High School Theatre Festival. Over 50 Southern California high schools participated in this two day competition. Costa Drama performed a five minute scene from “The Addams Family”, their upcoming spring musical. “The Addams Family” opens April 22. For the first time in Costa’s history, our Technical Theater teams placed 1st and 2nd overall in the Tech Olympics category. The Tech teams won a total of 9 medals in categories such as Wiring, Costume Quick Change and Tool Identification. 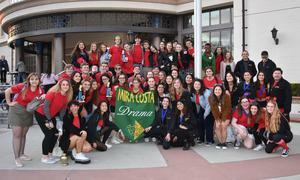 In addition, Mira Costa took top honors in Theater Games — a competition of improvisional games. Last weekend Beach Cities Robotics Team competed in the FIRST LA Regional Competition. The team finished 2nd overall in a competition with 66 teams competing! The team’s 2nd place ranking enabled the team to advance to compete in the FIRST Championship in St. Louis, MO at the end of April. Click photo for pics and details. Four thousand students from schools of 13 different nations around the world competed over 3 1/2 days. Mira Costa is a "3 peat" champion from past years. Our team consisted of 40 students: 7 seniors, 18 juniors and 15 sophomores. When we go to NY we go to compete at one of the most elite and well run conferences in the world. Other groups tour, we take on the best and the brightest. Any country, any topic, any time. Costa Dance Team Division Champs! At a recent competition, Mira Costa's Dance Team received 1st place in jazz, small jazz and lyrical divisions; 2nd in hip hop. Caprina Benson and Samantha Lonergan won 1st place with their solos. These high scores qualified the Team for division champions in three categories! Now they have to figure out where to showcase their 5-foot trophy. Good luck in Nationals! Congratulations to Miriam Sachs, the first Mustang to both compete at and place in the state-level competition of Poetry Out Loud! As the Los Angeles County winner, Miriam went on to compete at the state capitol against 38 other contestants from counties all over California...and she was awarded 3rd place! Congratulations to our Mustang musicians who were invited to perform with the 2016 All-Southern and All-State Honor Bands and Orchestras. 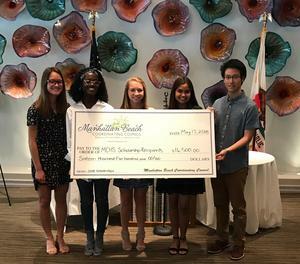 These accomplished student-musicians were selected through a competitive audition process that involved several hundreds of highly skilled high school students from throughout California. Click here for a list of our honor musicians. Congratulations to the twenty-four student musicians who performed in the Rotary Solo Music Competition Finals on Thurs., January 21. Each finalist advanced by performing in a competitive preliminary round earlier in the month. Click here for a complete list of finalists. Congratulations to Rachel Bloom (MCHS Class of 2005) for winning the Golden Globe award for Best Actress in a TV comedy! Costa girls joined Vox Femina, one of the premier women’s choruses in the United States with a demonstrated ability to perform highly eclectic repertoire, for the 3rd year in a row Sunday night for a brilliant performance. Congratulations to the MCHS Marching Band and Colorguard who had a fantastic performance at the Oxnard H.S. Tournament on Nov.7, with the band winning Tournament Sweepstakes (including all caption awards). Percussion placed 1st in the 4A division, while Colorguard placed second. What a great outcome for all their hard work! The Mira Costa Marching Band and Colorguard gave a stellar effort in their 2nd of 5 field competitions on Oct. 17 in their show : "Stratosphere Above the Clouds." They placed first in their 4A division for Band and Auxiliary and Percussion placed first in Sweepstakes! Mira Costa is in the top 1% of high schools nationally! On both the US News and Newsweek rankings Mira Costa is listed in the top 500 high schools in the Nation! Mira Costa’s Newsweek ranking is 341. Mira Costa’s US News ranking is 375 and received Gold medal distinction. Click headline for more info! ACT scores rise for the 5th year in a row! Mira Costa students, for the 5th year in a row, increased their performance on the ACT in EVERY category. Go Costa! Pooja Nagpal was selected by Girl Scouts of the USA to receive the prestigious Young Woman of Distinction Award (YWOD). Only 10 women are honored each year across the country with this award which is determined by their outstanding Gold Award project. Pooja and her family will travel to New York next month to receive her award. The emphasis is on empowering students to create authentic products that they can share with others beyond the classroom walls. Click headline for link to EdSurge story. We are proud to announce that rising sophomore PLEIA HALL achieved a perfect score on the 2015 National Latin Exam. Less than 1% of students across the globe attained this distinction. We are happy for Pleia and for her Latin teacher, Mr. Cook! Congratulations to Andrew Neal and Sara Kohrogi who were finalists in the NSSA (National Scholastic Surfing Association) High School National Championships held June 13-14, 2015 at Salt Creek. Sara finished 4th in the women's division and Andrew finished 6th in the men's longboard division. Congratulations to this year's CSF Life Members! Click here to see a list of our 2014-2015 CSF Life Members. We are pleased to announce that the White House Commission on Presidential Scholars has selected Costa senior Julia McDermott as one of 20 students in the country to receive this honor in the visual and performing arts. Julia will be recognized in Washington, D.C. in June where she will also get to perform at The Kennedy Center. Congratulations, Julia! 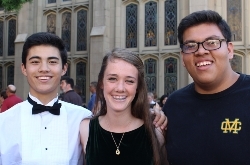 Andrew Anton, Kayla Elson, and Antonio Sellitto were selected to the 2015 California All State Honor Choir. In late March, our Mira Costa singers joined with 130 others from around the state for a weekend of intensive rehearsals, culminating in a beautiful concert. Congratulations to our outstanding singers. Congratulations to Moses Aubrey who was one of only fifteen musicians selected to receive a full scholarship to tour Japan for a joint youth orchestra program exchange! Facilitated by the Los Angeles Philharmonic and the Youth Orchestra of Los Angeles, student musicians from the U.S. performed with the Soma Children’s Orchestra & Chorus, including a combined open rehearsal with Gustavo Dudamel, music director of the LA Phil. The selection process included a written application and essay, as well as an interview and solo audition for a panel of five music judges. Moses is currently a senior and serves as the principal bassist of the Mira Costa Symphony Orchestra. Click this headline to read more about the LA Phil’s collaboration in Japan.